A permanent sculpture in Peace Gardens, Sheffield. 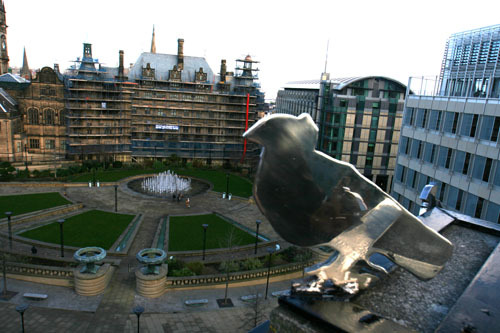 The stainless steel sculpture, features seven life-size doves perched on the chimney of Browns Bar, next to the Peace Gardens, was inspired by Pablo Picasso’s visit to the Second World Peace Congress held in the city in 1950. During his visit to Sheffield, Picasso arrived at Sheffield Midland railway station carrying a bouquet of chrysanthemums and wearing an old raincoat and blue beret. He was welcomed by members of the local communist party, the press, and the public, and taken on a tour of the city. He ate a bacon sandwich at Thorpe's cafe in Fargate; had his hair trimmed at Peckitt's barbers, and drew a ‘dove of peace’ on a napkin in Butler’s Dining Rooms. The Congress was to be a special debate on the Korean War, but the Government at the time refused to allow important speakers into the country and it was abandoned. 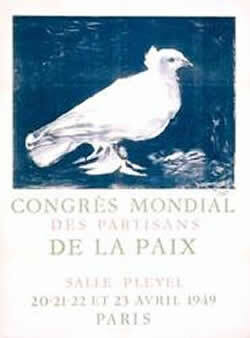 Picasso gave a short speech, recalling that he had learnt to paint doves from his father, and ending by saying "I stand for life against death; I stand for peace against war." Later whilst returning to London he drew another Dove of Peace on a napkin, which he gave to the bodyguard who had accompanied him around the city. This drawing is now part of Sheffield Galleries and Museums Trust’s collection and is now on permanent display at Weston Park Museum. 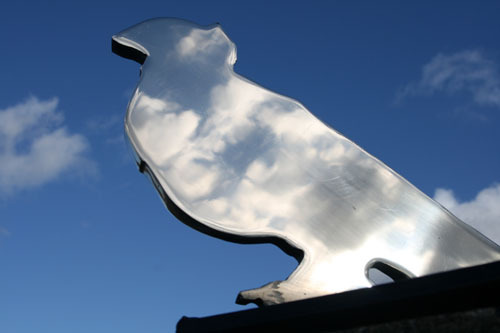 Richard Bartle has used the original poster, designed by Picasso, as a template to create the sculpture, in celebration of the memory of Picasso and the cause of peace that he introduced into an already radically thinking Sheffield. “Unemployment had destroyed Sheffield and the city was in decline when I first became aware of Sheffield’s radical edge. In my late teens the Peace Gardens became a favourite meeting place for my friends and girlfriends. Then as a young Punk I spent a great deal of time there chatting with like-minded people and enjoying the atmosphere. Now, as an artist, I am inclined in the summer months to sit there and eat my lunch. My memories of the place run quite deep. City of Peace has been commissioned by Fred Gould of Great Central Developments as part of the Percentage for Art scheme and was installed by Richard Bartle with assistance from Clive Smith of CS Roofing. 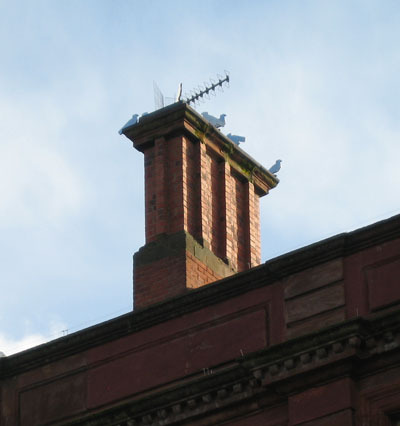 Richard Bartle is a nationally and internationally renowned artist who lives and works in Sheffield. He is a fine artist; founder of Bloc Studios in Sheffield (www.blocprojects.co.uk/studios); Director of Bloc Projects (www.blocprojects.co.uk) and Sheffield Contemporary Art Forum (www.artsheffield.org.uk). He is a critical philanthropist in the Sheffield art scene and beyond, providing work space and opportunities for many as well as championing the cultural growth of his native city. Bartle’s work is a critique on the behavioural and visual patterns of modern life. Using found images he creates visually stunning collages that are not only beautiful but reflect on the darker aspects of society in an attempt to provide the viewer with some sense of hope.